*All cars used in the tour have air-condition and in very good order. *All tours have full insurance provided by our local tour operator. *All tours are guided by professional licensed tour guided, selected carefully. Tour Time: 07:00 till 19:00. Pick up/return times can change depending on the locations of hotels. Price: Please ask for small groups. Price depends on total number of participants . Ephesus - (Efes) Enter through the Magnesia Gate and begin a slow, downhill walk with your guide into the ruins of this Roman provincial capital. Your route takes you past the Odeon, the Celsus Library, the Temple of Hadrian, the Fountain of Trajan and the Great Theater. The Theater had seating for 25,000, was the site where St. Paul preached to the Ephesians, and is used today for a local spring festival. What you see along the way: From Kusadasi, you travel north to St. John’s Basilica, passing the Byzantine fortress at Selcuk and the ruins of the Temple of Artemis. Continue to Ephesus Open Museum. After the visit head for the upper gate of Ephesus. By the end of touring Ephesus, return to Kusadasi. Ephesus: During both the Hellenistic and Roman periods Ephesus was the most important port and cultural center of the eastern world. The remains of the city are still spellbinding today. 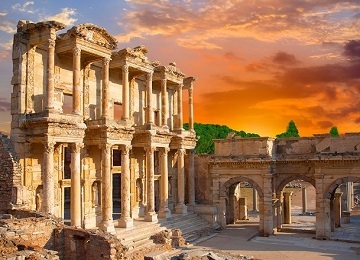 Of all the ancient cities of Turkey, Ephesus is the best preserved and most visited in all ages and is as popular as it was in ancient times. This is due to the miraculous discovery of the House the Virgin Mary. The city had splendid buildings and was dedicated to the Goddess Artemis, whose temple was considered one of the Seven Wonders of the World. The main monuments that we will see during the visit of this fascinating city are: the street of Arcadiane, the majestic theatre, marble road, library of Celsus, market place street of the Curettes, baths of Scholastic state agora, prytaneion, odeon. 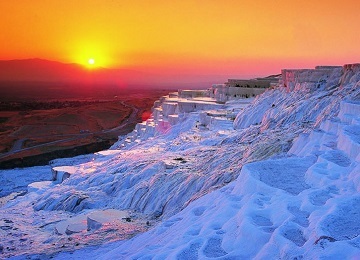 Pamukkale & Hierapolis daily tour from Bodrum. Price includes: Pick up/drop back from/to Bodrum hotels,, transportation, guidance, entrance fees and lunch. 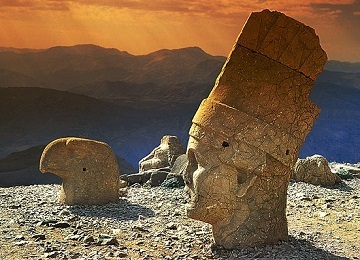 Visiting the amazing white colored travertines, hot spring pools and water terraces have been created by nature in millions of years on the mountain slopes of Pamukkale and the ancient city of Hierapolis which has the biggest ancient Necropolis of Turkey with 1200 gravestones. Pamukkale (Hierapolis) is one of the most enchanting and remarkable sights in the whole of Turkey with the great dazzling white plateau, almost 400 feet high, rising in a curtain of stalagmites and shallow pools, giving one into another on hundreds of different levels, and ancient city of Hierapolis located on this plateau. The great baths were constructed in the second century and are so well-preserved that they now serve as a museum. Private Pamukkale & Hierapolis from Bodrum. Price: Please ask for small groups. Price depends on total number of participants. Price includes: Pick up/drop back from/to Bodrum hotels, transportation with air-conditioned coaches, professional guidance in English, 4* hotel in Pamukkale, entrance fees to museums, one breakfast and one lunch on second day. Excluding: 1st day's breakfast and lunch, Cleopatra pool and Virgin Marry visits and drinks during lunch. Please don't forget to ask breakfast box from reception. Pick up from Bodrum Hotels a around 06:00 am. Pick up/return times can change depending on the locations of hotels. Daily Dalyan (Caunos) tour from Bodrum. Tour Time: 07:00 till 19:00. Pick up/return times change depending on the locations of hotels. Price includes: Pick up/drop back from/to Bodrum hotels, transportation, boat trip in Dalyan River, mud bath, guidance in English, entrance fees and lunch (except drinks). This area is national 'treasure' of the country with its unique wildlife and nature. Tour bus will take you first to Dalyan (Caunos), and there you will board on to a boat going up the river which will take you first to the mud baths and then to a restaurant for lunch and finally to the lovely beach for a long and joyful swim break; where the endemic Caretta Caretta turtles lay their eggs. These turtles can live up to 120 years, and they are in danger of being extinct. High on the cliffs above the Dalyan river you can see magnificently carved Lycian royal rock tombs. In addition to the turtles, the Dalyan delta is also home to many sea creatures like crabs, which can be ordered as a delicious sea food at a little cost. The area between the reeds and a maze of waterways. Enjoy a day of peaceful nature. 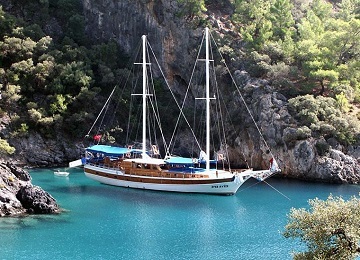 Private Dalyan & Caunos daily tour from/to Bodrum. Private Bodrum City Tour (Half day). The best opportunity to discover city center and the most historical places such as Bodrum Castle , Myndos gate , Windmills and Antique Theater of Halicarnassus. Price: Please ask. This tour is only available as private tour. Price includes: Pick up/drop back from/to Bodrum hotels, transportation with A/C cars. Tour Time: From 11:00 am until 17:00 o'clock. Please ask hotel pick up/return times. Price Per Person: 55 Euro per person. Price includes: Hotel transfers, open buffet lunch & unlimited drinks. We offer all inclusive daily boat tours operated everyday. Daily boat trip is a classic of Bodrum. The only way to see the beautiful islands and beaches around the coast of town, unreachable from the land. At the Black Island (Kara Ada), you can bath in the grotto where the warm mineral waters flowing through of the rocks are believed to beautify the complexion. Seize the day with swim breaks at Babla Bay, Camel Beach and Aquarium; a delicious lunch and drinks inclusive on the boat and the gratuitous sun above. (Please note that the itinerary - above places mentioned to be visited - can be changed by the captain of the boat due to weather conditions and technical reasons.) Although there may be exceptions number of participants will be around 15 pax usually. The boats used in these boat tours are sail boats or gullets, selected depending on final number of participants on a specific day. 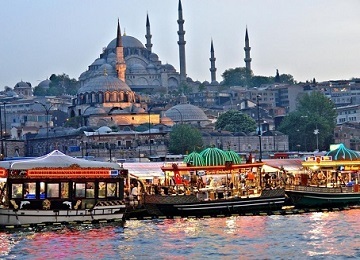 Private daily boat tours from Bodrum. Tour Time: 10:00 am till 17:00. Pick up/return times can change depending on the locations of hotels. 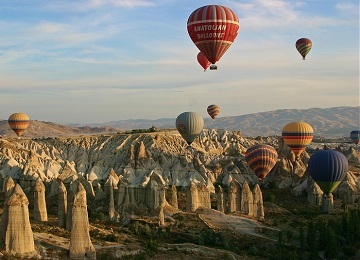 Price includes: Pick up/drop back from/to Bodrum hotels, tour guide, and lunch (except drinks). Please inform in advance, if you prefer self-drive. We offer touring the forests, mountains and villages around Bodrum by jeeps, covering approximately 130 km distance. For those who are ready to explore the nature, join one of our unforgettable and 'must-do' safari tours. You will really enjoy driving the jeeps yourselves ! Price: 70 Euro per person.. This is the only way to explore Bodrum's fascinating underwater world! Are you ready to explore miscellaneous species of the underwater? Accompanied by professional divers, you will make a total of two dives in a choice of 3 coves. Opportunity of diving to 7 meters depth for new beginners, accompanied and instructed by professional diving teachers. Professionals can dive to 30 meters depth 2 times. A night's event where you will experience the traditional Turkish ways and styles of entertainment. Turkish folk dances, traditional male belly dancers (zenne) and female oriental belly dances can be watched where you can even participate as well, if you dare. Unlimited food and local drinks included. Cos (Kos) is very close to the shores of Bodrum, and it is a very lovely intact small Greek Island far from the mainland Greece. This tour will give you an opportunity to visit this Greek Island which are in our immediate vicinity. A daily visit to another country from Turkey is also an interesting feeling. Citizens of EU, USA, Canada, Australia etc will not need need a visa, but still please please don't forget your passport. Other countries should inquire and handle their visa procedures via Greek Consulates in their countries. Price includes: 2 way ferryboat tickets, harbor tax and hotel transfers in Bodrum. We also offer private transfers from Bodrum Airport (BJV) to Bodrum hotels, with new model cars. Bodrum Airport - Hotel transfer prices are based on number of participants, the type of the vehicle and specific location of your hotel. Please ask for specific prices informing us about these details. For your information transfer prices are between 55 Euro to 100 Euro for up to 12 participants. Average Price: 240-520 Euro per person per week in double cabins; including tax, accommodation on gullet boats with en suite baths, breakfast, lunch, dinner, board games and basic snorkeling equipments. .
All you need to do is to select your reservation dates below to search all Bodrum hotels. Please see below for special deals and last minute offers for hotels in Bodrum.